These White Chocolate Raspberry Cheesecake Bites are perfect for birthdays, holidays, parties, and anytime sharing! They're dense NY style. Luscious, rich, smooth, creamy cheesecakes strewn with real raspberry and topped with homemade whipped cream. Make Crust: In a large bowl, mix fine cookie crumbs with butter until well incorporated. Should resemble wet sand. Scoop 1 slightly rounded tsp crumb mixture evenly into 48 lined mini muffin tins. Press down to form bottom crusts. Preheat oven to 325F, with rack on lower middle position. Make Raspberry Sauce: Combine raspberries, sugar, and dissolved cornstarch in a saucepan and bring to a boil, stirring often. Once mixture is thickened, remove from heat and set aside. Make Custard: In heavy saucepan, melt white chocolate chips together with half and half on low heat, stirring often. Remove from heat. In large bowl, mix together nearly melted cream cheese and sugar until smooth. Beat in eggs one at a time. Add vanilla and the melted white chocolate mixture. Scoop 1 rounded TB custard evenly into lined mini muffin tins. Dollop ½ tsp raspberry sauce over the custard. Gently use a thin knife to lightly swirl. Bake 20 minutes or until tops are puffy and no longer sticky upon light touch. Let cool to room temp and then cover and chill in fridge. If keeping longer than a couple of days, you can freeze them. Top with Stabilized Whipped Cream and serve. 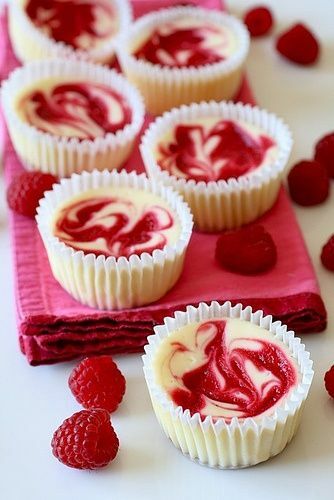 0 Response to "White Chocolate Raspberry Cheesecakes Bites"